Fantasy sports have found their own special place amongst all the sports lovers around the world and within a span of few years; we have seen numerous fantasy sports website taking over the web world. Moreover, when it comes to a sports loving nation like India, fantasy sports have been able to make a big mark in the recent times and attracted millions of sports fans in the process. Fanfight is one such sports fantasy website which has grown into big numbers ever since its inception few years back. Fanfight is based on a simple fantasy sports model which brings in a golden opportunity to all the sports lovers to win some great cash prizes by just investing some nominal amount on various sports leagues. If we talk about the user interface and graphics quality of the Fanfight, it surely won’t disappoint all the sports lovers who would like to try their skills and knowledge about sports to win some good cash in the process. User can simply check out all the available leagues on the website after clicking on the game center option and they can simply get Rs 30 cash bonus to play after signing up with their email id or facebook ID. Moreover, the user interface is quite easy to navigate and even a beginner can easily find all the available leagues and matches under a specific list along with the deadline timer on the sidebar. Also, the themes used and gaming graphics are quite attractive and brings on a resounding experience to any sports lover whilst playing their favorite cricket or football leagues. Once you login to the website of Fanfight, you will come across the option of “ Join for free ” on the homepage itself and after clicking the same, you will get the option of signing up with your email id or Facebook Id. Once you enter all the required details, you will need to verify your mobile number with an OTP received and once you are through with the process, you will instantly get Rs 30 in your account to play with. How to Start Playing on Fanfight? After getting through with the same process, you need to pick any of the sports from either cricket or football. Once you have picked your desired sports, you are now required to select a team with the available credit budget of 50.Please note that every player would be having a specific credit amount to their name and you need to accommodate your team within the available budget. Unlike all the other sports fantasy platforms, here you can pick only 6 players for a game and your winning would solely depend on the performance of you team’s players. Once you have selected your favorite list of players under a specific league, you can now join various contests available under the free or cash contest list at Fanfight. Once you have picked your team and put in under the selected list of cash contest or free contest, your wining would now depend on the performance of your team in that specific match. 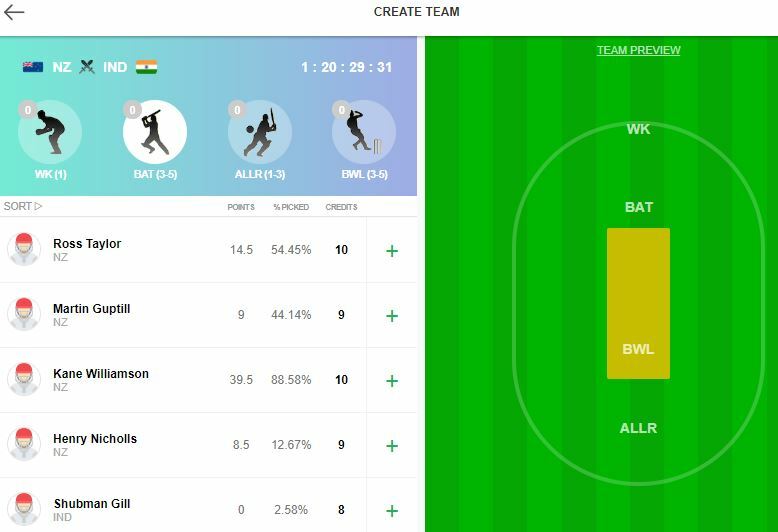 How to Select a Team Under the Cricket Section? 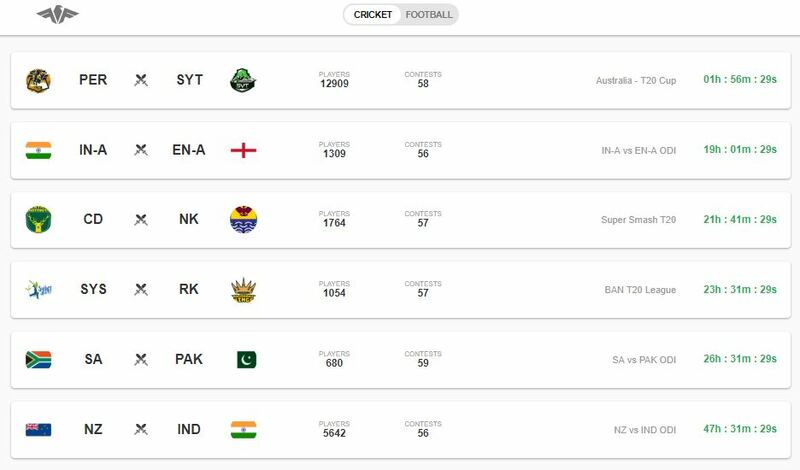 Once you are signed up to Fanfight, you can now pick any of the sports from either football or cricket and once you have selected cricket, you will now enter into the list of all the available matches and upcoming fixtures in the same section. Once you have selected any given match of any ongoing league or tournament around, you will now go through a list of contest based on your preference to play free contest or the cash contest. Moreover, to get enrolled under the same, you will have to select a team of 6 players with 2 bowlers, 2 batsman, 1 wicketkeeper and 1 all-rounder with the available credit budget of 50.Also, every player will; be allotted a specific credit amount and you have to accommodate your list within the available budget only. Once you have selected the list, you now have to chose your captain (who will give you 2x of the total points scored in a match) and a vice captain( who will give you 1.5 x total points scored ). Also, the bonus amount can be sued to enter into the leagues with the “B” badge only and the match deadline would end an hour before the start of the match. Moreover, whilst selecting the cricket team, you can choose a maximum of 4 players from each side under the fair play policy of the Fanfight. How to Select a Team under the Football Section? After getting registered to the Fanfight, you just have to select the football sport form the list and once you pick the same, you will now enter into a list full of all the current and upcoming fixtures in the football world. There you need to select any of the given matches of your choice and once you does, you now have to select from the available list of free and cash contest as per your budget and preference. Afterwards, you are now required to create a team of 6 players from the available credit budget of 50 which must include 1 goalkeeper,2 defenders,2 midfielders and 1 forward. The players need to be selected in such a manner which makes your team consisting of best players with the available credit limit in order to increase your chances to win the contest eventually. Moreover, just like the cricket, you are allowed to pick only 4 layers from team as per the fair play rules at Fanfight. Once you are done with the team selection, you are now required to pick a captain (who will give you 2x of the total points scored in a match) and a vice captain ( who will give you 1.5 x total points scored ).Just click on save and join any of the given leagues as per your preferences. Also, the bonus amount can only be used to play leagues with the “ B” badge and all the contest gets closed before an hour of the start of the actual game. How to Refer and Earn on Fanfight? 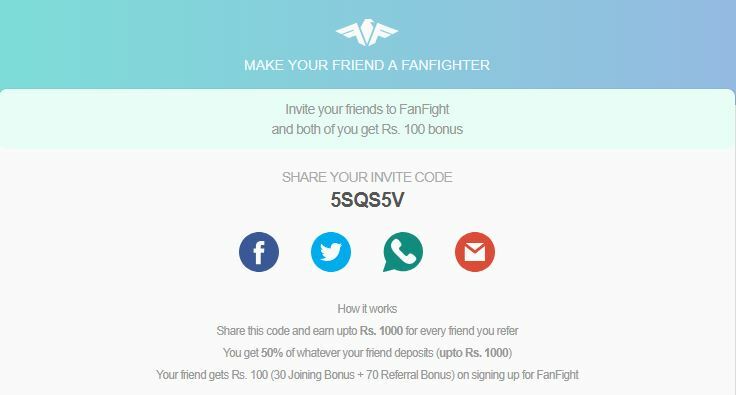 Once you are successfully registered on Fanfight, you can now also invite your friends to play along all the available cash and free contest on Fanfight and they can make you earn a referral bonus of Rs 100 in the process as well. All you have to do is send them your referral link or code and once they login and register using the same link, you will get a referral bonus of Rs 100 and they will also get Rs 100( Rs 30 as a sign up bonus and Rs 70 for using the referral code). It must be noted that this referral bonus offer is available on Fanfight android app only and the referral links can be shared on various social media network as well. In order to withdraw your earning after winning the cash contest at Fanfight, you first need to verify your account by following the below steps. – Once the email id and mobile number is verified, the pan card and aadhar card details need to be entered along with your birth date. -After getting through the same, you now need to enter your bank details like Account holder name, Account number , Bank name, IFSC code and the bank account proof like front page image of the pass book or the image of the cheque from the cheque book mentioning all the bank details. On the top of the list , you will see the beginners contest which is specially designed for the new users and carries along a reasonable cash prize with a nominal entry fee around. This type of cash contest can be said as the first step before you start playing some of the bigger cash contest at Fanfight. Here you will also find a number of multi teams contest where you can join in many other users in the race for a big cash prize whilst testing your skill and knowledge in regards to a particular sport. The entry fee is going to be a bit higher than the beginner contest but the prize amount would also be higher in the process. Once you are through the beginners contest, you can try out your skills and luck with these multi teams contest. These are the contest which is specially designed for users who would like to play with other users in a “one on one” basis. The Entry fee depends on the size and prize money of the contest and user can choose any of the available contests as per their preferences and budget. Moreover, this is termed to be the contests with the best chances of winning as you will be competing with only one of the players instead of competing with numerous other players in the bigger leagues. Mega contests are purely based on your skill set to pick the best team according to your knowledge of sports and if you are the one with the best combination onboard, you got every chance t take home a grand prize consist of big money. Although the chance of winning these contest are slightly lower than the other contests mainly because of the number of users participating arte huge, it purely tests the overall capabilities of a user to form the best and the right combination of players for a particular game. 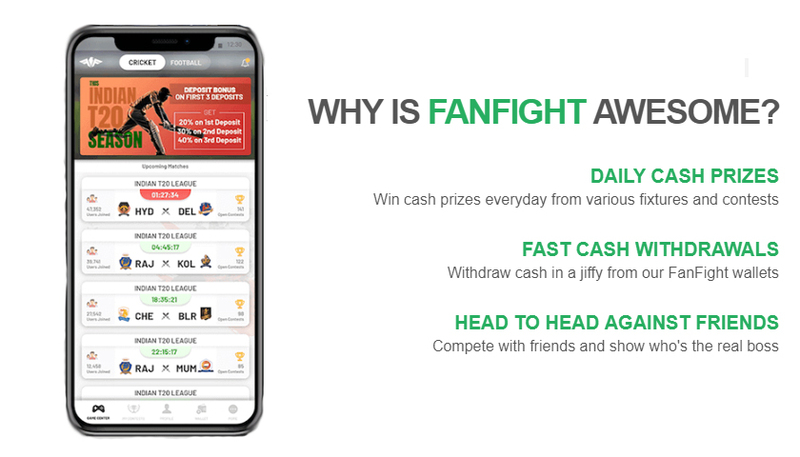 All the users which are registered on Fanfight can make deposits on their account with numerous options like Debit card, credit card, net banking, paytm and so on and they can also withdraw using the same option and they further need to verify their account in order to withdraw their winning amount from Fanfight. 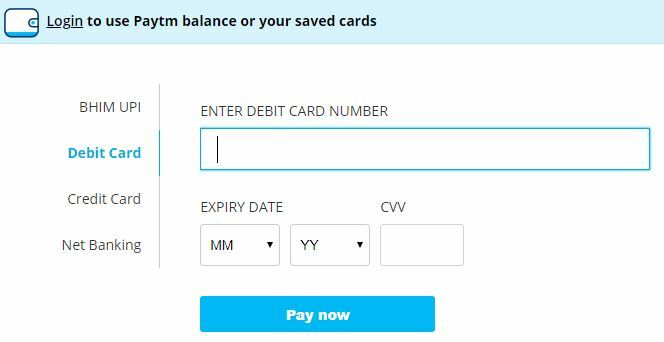 Moreover, you need at least Rs 100 in your account to withdraw and once the verification process is done, you can directly take it into your bank account or paytm wallet. Also, the amount gets credited within 48 hours of the verification process and the process is just one time in order to ensure the safety and security of the deposits and withdrawal of all its users. Once the account of all the users will be credited with their winning amount, the users are liable to pay a TDS amount as per the income tax ruling of the Indian government. Moreover, if user has won more than Rs 10000 in any of the cash contests, he or she is liable to pay 30.9% for TDS and rest of the amount will be credited to their respective accounts as a winning amount. Additionally, all the users will be allocated with TDS certificates which will be a proof with them about the deductions of taxes on their respective winning amounts. When we talk about the customer support at Fanfight, same can be said as quite satisfactory in terms of response received. Users can’t chat with the support team directly and they have to fill in a form along with all their concerns and details while attaching the screenshots of the issues they are facing during the game. The response received by the Fanfight customer support team is quite prompt and all the feedback and complaints can also be forwarded in the same regards. Q) Can a user create multiple accounts on fanfight.com? Ans) Creation of multiple accounts with a single email id on fanfight.com is strictly prohibited and tracing of the same act by any of the user can attract immediate suspension of the users account from the fanfight.com. 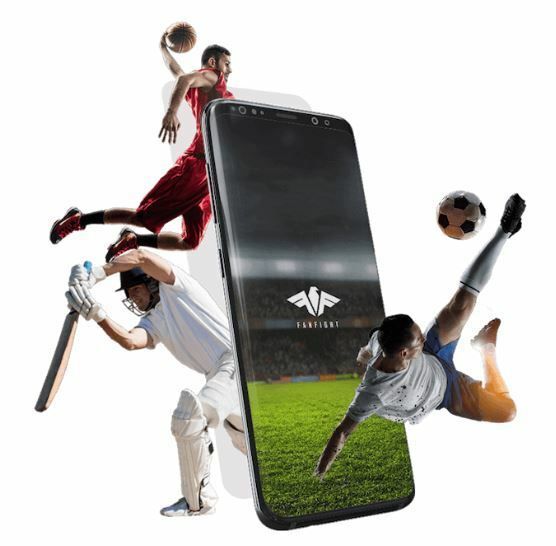 Moreover, Fanfight have laid down certain fair play policy for its users in order to ensure a better virtual playground for all the sports lovers. Q) How can I create multiple teams for a single match? Ans) Creating multiple teams for a single match is quite easy and the users has top just select down contest with the badge “ M” and once they get registered on the fanfight.com, they can enter into these contests whilst creating multiple teams in the process. Moreover, creating multiple teams would enhance the chances of a user to win that particular league whilst trying different combinations in terms of players, captain and Vice captain. Q) Is fanfight.com legal to play? Ans) fanfight.com did abide to every rule laid forward by the Indian government in terms of cash contest and games operation ruling in India and apart from some of the states like Telangana , Assam, Odisha, Sikkim and Nagaland, citizens of all the states can take part in all of the cash contests at fanfight.com. The ruling in these states have barred all the users to enter into any type of cash contests online so users there cannot participate in the same contests on Fanfight. Q) What if anything comes in violation of the fair play policy at fanfight.com? Ans) All the users at fanfight.com are always advised to follow the fair play rules and regulations on the website and all the related terms and conditions are available to read on the website for its users. Moreover, in case if there is a breach of any term or condition by the user, the account can be blocked right away by the fanfight.com support team except in case when the account is quite old. Fanfight is one of the fastest growing fantasy sports website in India and within a span of just few years, it has secured millions of registered users to its platform. Whilst that been said, it can also be said that fanfight.com support team needs to work a bit in their support function where the users must be provided with a chat option to communicate for getting better and faster responses, Apart from that, everything from its users interface and gaming system is on par with all the other fantasy sports websites in India. Therefore, we can surely give fanfight.com a big thumbs up for its amazing gaming experience to all the sports lovers in India. Can residence of odisha participate at fanfight?